If you haven’t read The Blue Bottle Tree’s comprehensive review, you’re going to want to check that out. Many of my tips are spin offs or direct take offs from Ginger’s great suggestions. different. You are doing the same thing for your LC Machine, just using it in a different way. My width chip samples are only for the individual settings on my Atlas. In Ginger’s article, she goes above and beyond to make additional width guides. NOTE: Once you begin using the LC Machine, you will get used to the new width settings and know exactly where your markers are intuitively. I have now used my Machine for about a month and I don’t need my chip stack anymore. And the width guide hangs nicely off the width limiters (that don’t work) if you’d like. You will find that once you begin using your machine that you get used to the width guide and wheels very quickly. Here’s the small issue I’ve noticed. I tend to finger tighten (see #3 below) one side tighter than the other. While I don’t notice it initially, I do by the end of the day as the far side of my machine is narrower than the side I’m using for the majority of my rolling. If I’m working a long day, I’ll need to reset my width settings about mid-way through a long clay day. Otherwise I will reset my LC Machine at the start of every day. How to Reset Your LC Machine: Use your width guide to completely close your rollers. This will make sure your rollers are completely even. Take your left & right stops on your width guide and loosen them about 6 turns. Now set your LC Machine rollers where you want to roll your first clay sheets. When it comes to the left and right stops for your width limiters, do not tighten too tight! These are meant to be stops, not tightening rods. Once I have my width set on my main width wheel, I thumb tighten the stops until they just TOUCH the rollers. Once you feel the tension very slightly loosen the stop. The idea with the stops is that it will keep the rollers from spreading while your are conditioning your clay. There is no need to have these tight. In fact I don’t recommend using your LC Machine this way. Now I will never get confused again! You can easily clean the LC Machine and it is a quick and easy process to do. However, getting your front and back blades mixed up and having them not “fit” correctly can become a problem if you have a few short term memory issues like I do. Okay, let’s be honest, it has nothing to do with my memory, but everything to do with the fact that I simply don’t pay enough attention. I solved that problem very simply by using a Sharpie marker (which will rub off over time) to mark my blade as “front” and “back.” Since doing this I haven’t gotten my blades mixed up even once. I’ve covered both the metal housing and blade with packing tape. Next I will trim off the ends of the tape! There is a problem with clay getting wedged between the replaceable blades and the metal frame itself. The Blue Bottle Tree recommended using Con-Tact Paper over both the blade & housing to prevent this issue. My issue? I didn’t have any Con-Tact Paper. One of the things I did have however was heavy duty, thick HD Duck Packing Tape. You know what? It works just as well! So if you don’t have Con-Tact paper, reach for that packing tape! 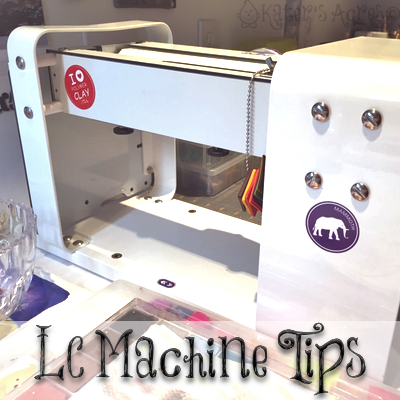 I hope that these 5 LC Machine Tips will help you use your new LC Machine! Feel free to leave your suggestions or tips in the comments below. I’m glad you got it figured out. Sometimes just the act of reading it again in different wording helps.